What follows are some thoughts I had in the wake of Cassini’s finale. It’s a shorter and rougher version of what I originally envisioned, but it’ll do for now. All errors of accuracy and grammar are my responsibility alone, though I would blame the fact it was written in the course of an hour-long airport layover. As soon as I felt the airplane’s wheels scraping back against the Earth, I turned my phone on, but it was already gone. I scrolled through my feed, trying to find the moment I knew I had missed. At 7:55 eastern daylight time, to the extent earthly concepts of time mean anything when discussing interplanetary travel, and while I sailed above cell towers without a signal for the first time in weeks, if not months, Cassini lost its tether to the Earth one final time. Spacetime is a funny, nearly incomprehensible thing for someone like me, so I don’t know at what point to mourn Cassini’s end: the exact moment we lost its signal, backdated to account for the hundreds of millions of miles it traveled? The moment we received its message? Some unknowable point after it stopped transmitting and Saturn’s atmosphere, an unfriendly mix of hydrogen and helium, began tugging at the vessel just a bit harder, its molecules resolutely standing in the way of Cassini while it flew at tens of thousands of miles per hour, battering it with an ever-growing heat that turned the gas into a sunset-colored plasma? And what, I wondered, will replace it should our earthly problems seep past the upper reaches of our planet? After all, on the TV that hung above the boarding lanes of my gate, the talk was nuclear war. Shortly before, while I was still at my seat waiting to be called I refreshed my phone again. “Happening now: the spacecraft is reconfiguring to transmit its final observations to space in real time.” By that point it had already crossed the path of Enceladus and the outermost rings of the planet. Its moon, its rings. Without it, they were distant concepts: seeable to some but enigmatic to all. It was speeding along at a pace unimaginable to human vision or minds, save for its numerical measure (69,368 mph, to be exact). And all the while—its eyes and ears and mouth and nose, with names I can barely string together—were wringing that experience for all that it was worth: the composition of the planet it would soon become, its temperature, its magnetic field. It still took us over an hour to hear its observations of these moments, but when we did, it was in Cassini’s own words coming in directly as it witnessed them. In 2013, those eyes looked back towards its first home, a place it only spent its first waking moments. We appeared as no more than a distant speck, to be sure, but if you looked up at that moment, your eyes would meet. The most that can be gleaned from the resulting photo is confirmation that we do, in fact, exist and that our world which feels so very large to us is unimaginably small even within the bounds of our own solar system. In the photo, the three agencies encompassing 24 countries all blurred into one. To its eyes, that’s what they always were. This has always been an incredible fact about space, if not in actuality than at least in perception: that it is a last bastion for cooperation not in the name of profit, security, or technology, but for the most profound and most human quality: curiosity. I am, of course, glancing over the impetus that caused humans to quickly reach up towards the stars and some of the applications for which we use the room above us, but the mere fact these do not preclude this curiosity from driving ambitious ventures remains one of the more heartening qualities of life on Earth. I can’t profess to know with any certainty how far we’re slipping from this ideal. Whether, in casting aside pure science in the name of placing humans farther outside Earth’s gravity will cause our multitude of problems to tag alongside them, or whether, through some unknown mechanism, we’ll rinse them from those pioneers. I can only hope. Perhaps that’s why, despite its lack of a beating heart or a self-sufficient brain or eyes that can interpret what they’ve seen, Cassini still draws us like iron filings to a magnet or gravity’s force upon an object. Without these organic bits and pieces, none of humanity’s problems assert their will on it. There is only curiosity distilled to its purest form and with such a strength as to be capable of transmitting it across a vast distance I cannot hope to understand. 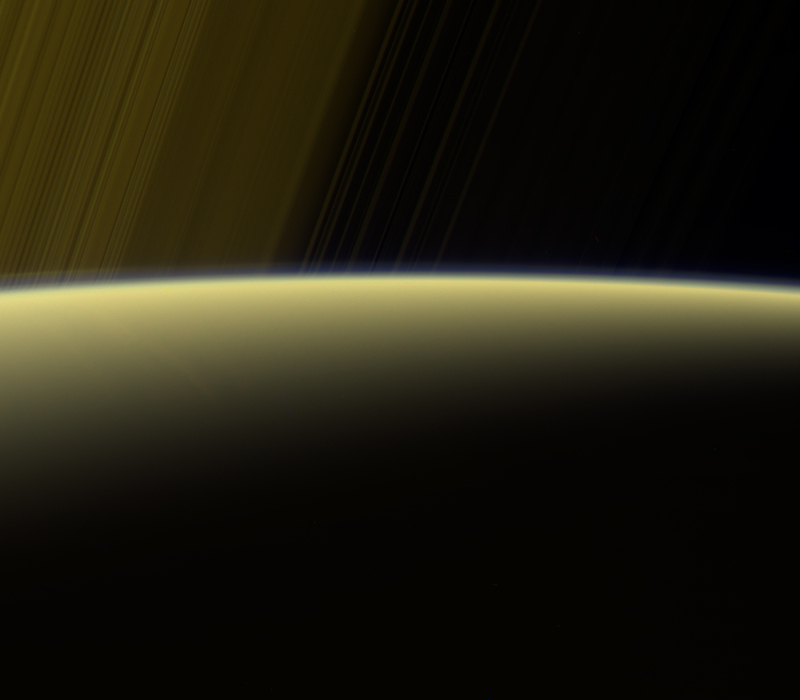 For that, Cassini, I miss you already.